Member for Heffron Ron Hoenig joined with Jewish community leaders Rabbi Mendel Kastel, CEO of Jewish House and Rabbi Mendel Grossbaum to spread the cheer of Purim at Sydney’s Prince of Wales Hospital, Randwick. The group visited patients and people in need in the hospital wards to deliver Purim gift bags, with an assortment of hamantash, gragger, and other kosher treats. They also took time to visit the hospital chapel for a period of quiet reflection. The Purim hospital visit reflected the miraculous salvation of the Jews in Persia from their annihilation by Haman. by bringing the miracle of charity and care for the less fortunate,. 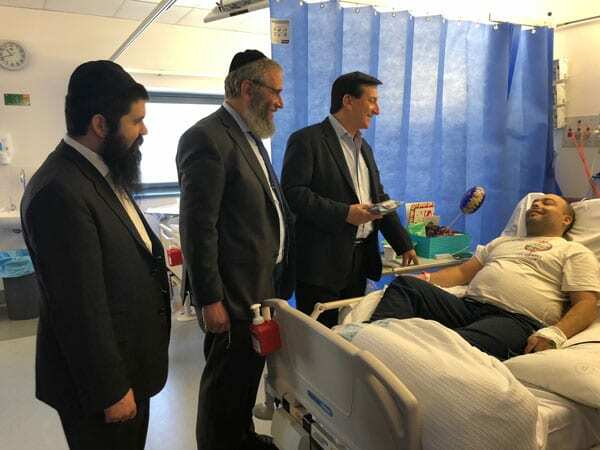 The visit is part of Rabbi Kastel’s regular chaplaincy at the hospital, where he makes regular visits. Rabbi Kastel is celebrating his 10th year as the CEO of Jewish House, for which he was awarded an Order of Australia Medal for his services to the homeless and others in need. Jewish House has recently launched its unique “JH Kids” support service for children experiencing challenges in learning, well-being, social-emotional or behavioural development. Ron Hoenig is the only Jewish Member of Parliament in NSW.